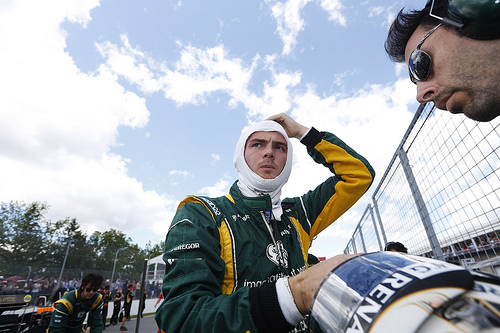 Giedo van der Garde has apologised to Mark Webber for their collision during the Canadian Grand Prix. Van der Garde and Webber made contact when the Dutchman was being lapped, resulting in front wing damage for Webber. "I want to say sorry to Mark for the incident we had and I’ll make sure I learn from the stewards’ decision." "Sometimes you make mistakes, but the important thing is to accept them, learn from them and move on." Van der Garde was also involved in a collision with Nico Hulkenberg, for which he was given a five place grid penalty for the British Grand Prix. Team principal Cyril Abiteboul says Sunday's Canadian Grand Prix reversed Caterham's recent upward momentum. "The race in Canada put a rather radical stop to the positive trend we have seen since Bahrain, and we have to reverse that for Silverstone and come back fighting there," he said. "We will have new parts for the British Grand Prix and we’re running another aero test next week, so we hopefully have the chance to make amends."